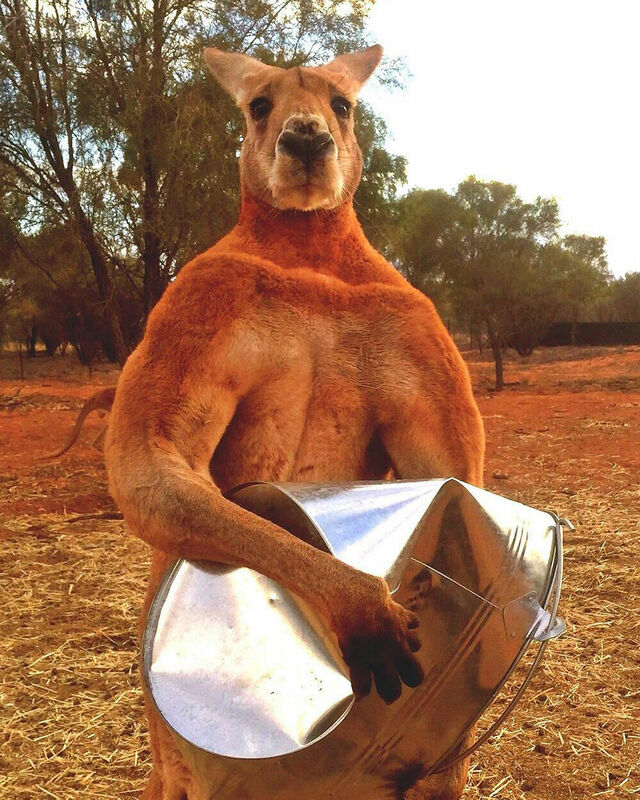 Internet-famous kangaroo Roger, which was rescued as an orphaned joey and grew up to be the world's most buff kangaroo, has died at age 12. "It is a very sad day here today, for we have lost our beautiful boy Roger," The Kangaroo Sanctuary in Alice Springs wrote in a Facebook post last Saturday. The sanctuary, in central Australia, said the well-loved kangaroo died of old age. "He lived a lovely long life and was loved by millions around the world," the post read. Roger became an orphan after his mother was killed in a car accident on a highway in 2006. He was rescued from his mother's pouch by former national park tour guide Chris "Brolga" Barnes, who went on to set up the 76ha sanctuary to care for him, the Washington Post reported on Monday. Eventually, Roger grew to an impressive height of more than 2m and weighed 89kg, boasting a muscular stature that set him apart from other male kangaroos. He wielded an undeniable charm in the sanctuary, which currently has more than 50 kangaroos, and soon became the alpha male of the herd, with 12 partners. In 2015, Roger shot to fame on the Internet after a video of him crushing a metal bucket with his bare paws went viral, reported the BBC. fame on the Internet after a video of him crushing a metal bucket with his bare paws went viral. But in a video a year later, the sanctuary revealed that the once sprightly marsupial was suffering from arthritis and failing eyesight, and had lost weight. When the news of his death broke at the weekend, many netizens expressed their sadness online. Mr Barnes, who told BBC that kangaroos can live up to 14 years old, said Roger has been buried in the sanctuary.